With World Famous Line Dance Guru Stella Cabeca!! 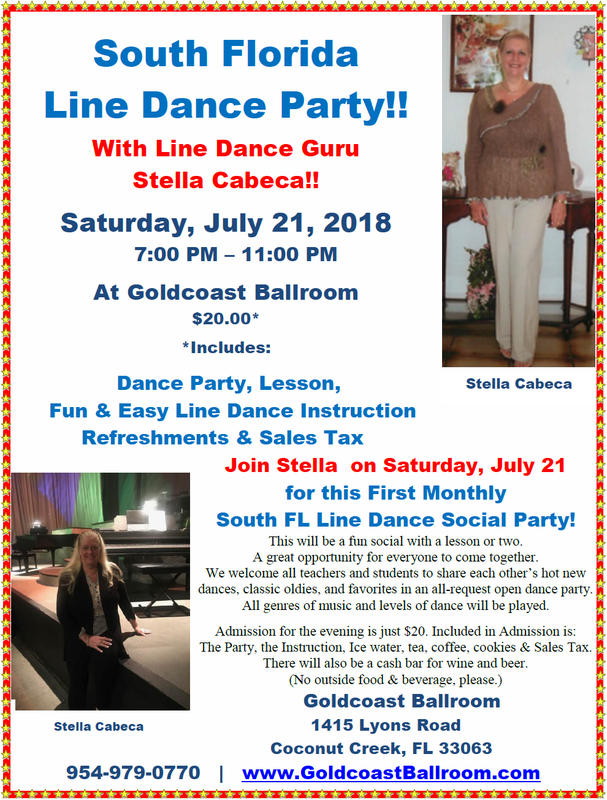 “Stella Cabeca is a professional, full time line dance instructor, who was born in Manchester, England and moved to South Florida in 1980. Her main love first and foremost is teaching dance, to which she devotes her life. Stella Cabeca has been a professional dance teacher, choreographer, and entertainer since 1993. She has traveled internationally as a guest instructor and judge at many dance competitions, talent shows, and beauty pageants. Stella has worked on T. V. commercials, music videos, newspapers and radio. named The “Miami Herald named Stella Cabeca ”Dance Guru” and she was also named the “Gracie Fields” of Country dance in the U. K..
Stella was nominated for top female personality of line dance world and female horizons in 2005 and is currently teaching all levels of International line dance in South Florida for all ages. More information about Stella Cabeca can be found on her web page on Line Dancing News About Stella Cabeca.